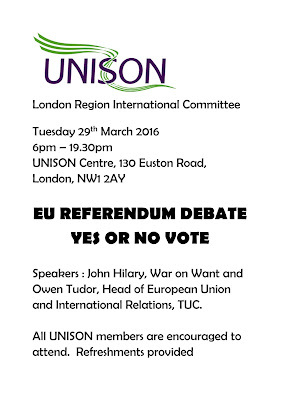 UNISON is carrying out a consultation of its members on the EU referendum. Next week there is a meeting at our HQ in London. Last week UNISON National Labour Link Committee voted overwhelmingly for staying "IN" (warts and all). Check out the website "Another Europe is Possible". In my personal capacity this message below has gone out to UNISON colleagues. · TUPE - (Transfers of undertakings) rights when an organisation (eg a public service) is being outsourced or transferred. · Fair treatment rights for agency and temporary workers. · Health and safety regulations. I hope you will join with us in campaigning for a YES vote in the coming referendum, and calling for a pro-worker social Europe. For your information we have prepared a standard motion (below) for your branch to pass! Contained here are the links UNISONS consultation. Please let us know if you are interested in being involved in the Campaign. On Thursday 23 June 2016 there will be referendum in the UK on whether to remain or leave the European Union. UNISON is currently holding a consultation on whether or not to take a policy decision and campaign on the referendum. This consultation will finish on 5 April. The UK has been a member of the European Union in its various forms since 1973. In 1975 there was a previous UK referendum on membership and voters decided 2:1 to remain. We are proud to call ourselves internationalists, and recognise that globalisation requires cross border- co-operation in order to regulate markets in favour of workers. That a major driver for the formation of the EU was to prevent war between France, Germany and the UK. These rights would be under threat if the UK was to leave the EU. The current Tory Government is opposed to these rights and we were to leave is likely to dismantle them. If the UK left it is also likely that any bilateral international free trade agreements negotiated by this Conservative government will be far more anti-public services and anti-workers’ rights than any negotiated by the EU. The EU has been an important “brake” on past and present Tory Governments in their attacks on public services and workers’ rights. That if we leave the EU it may lead to the breakup of the United Kingdom since it is likely that Scotland and Wales will want to remain inside the EU. That the Labour Party and the Labour Leader, Jeremy Corbyn is in favour of remaining in the EU and then reforming it in the interests of all citizens and workers. 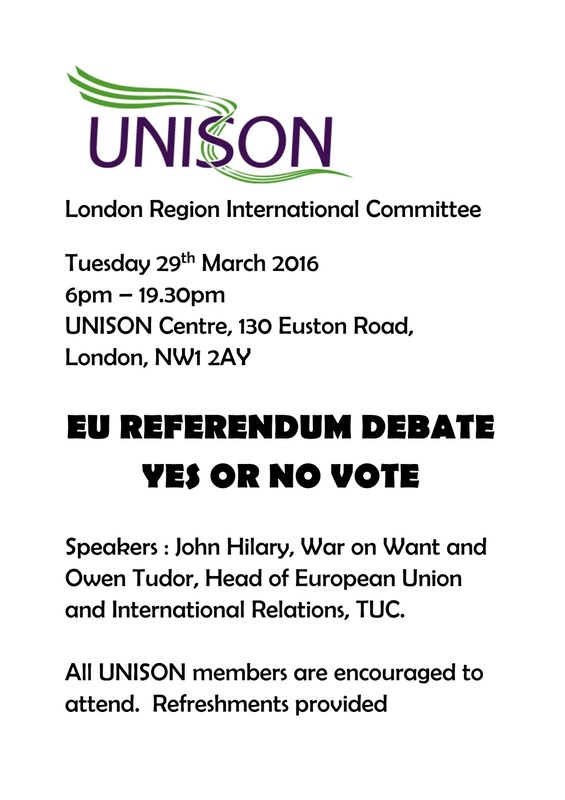 The issue of whether or not to remain in the EU is very important to UNISON. Economic prosperity, preserving existing and furthering employment rights, equalities, retaining pubic services and influencing bilateral treaties are key issues. UNISON should provide branches with materials and information. It is in the interests of the UNISON members and the UK to remain inside the EU and work within for change and reform.